Among the most famous marbles of Sicily and used in construction and interior and exterior architecture, the Cremino has also made its mark, distinguishing itself from the other varieties of cream marble for its characteristics and origin. The Cremino is a precious marble extracted, worked and produced almost exclusively in the area of Custonaci, in western Sicily. It is a type of marble that belongs to the same family of the famous Perlato di Sicilia and that boasts a variety of remarkable use. Used in modern building for numerous outdoor applications, Cremino marble lends itself perfectly to urban and interior design, thanks to its technical and aesthetic characteristics. The composition of Cremino marble is essentially composed of fossiliferous limestone. 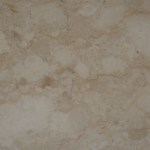 Hence the characteristic color beige clear with particular white patches of pure calcite and elegant veining irregular orange that make it a truly refined marble, but not for this not very functional. The chemical characteristics of this variety of Sicilian marble, together with the mechanical and technical ones, allow in fact many options and fields of use, further expanded by its great decorative value, for a material that uniquely combines appearance and practicality.